The above photo of my dad and my mom was taken in 1962 – a good year before I was even conceived or thought of. 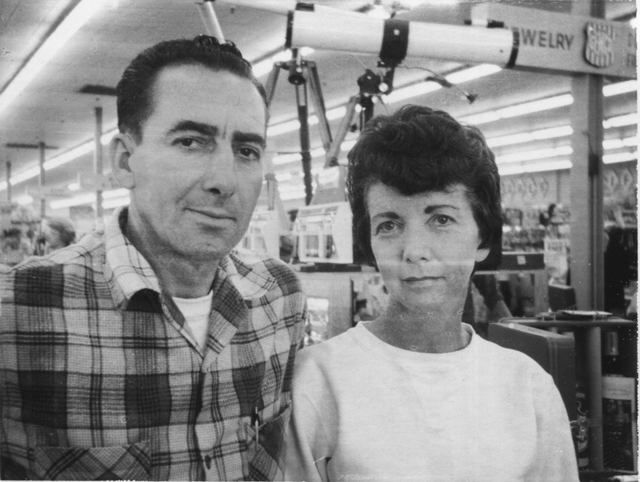 It was taken at a department store called GEMCO, which was a membership only store [think Costco but in the early 60’s] in Southern California. Without knowing more history than what my mom told me, they were there and a Polaroid demonstration was going on with their new instant camera. The lack of smiles on both of their faces also tells me what my mom did, which is that they were not in a good place at that time. Amazing that I still happened, but perhaps they worked things out long enough before my dad left to have me. This is one of the only photos that I have found of my dad. I only saw him twice while he was alive, at least from my memory and again, from what my mom told me given my early years as a kid. The only time I do actually recall in my current memory of seeing my dad was when I was almost 9. It was at the Orange County Jail in Orange, CA. My mom took me to visit as my dad got thrown into jail for failure to pay child support. Back then, his part was $2 a day, which equated to about $60 a month. This photo also stands as one of the only that my mom saved of her and my dad actually together in the same picture. My dad died on June 7, 2000 – 7 days before his 82nd birthday. This week, he would have turned 98. With pretty much no memories of my dad, his birthday passes with just a simple thought of how old he would be. I never went to his funeral nor did I get a mention in his obituary [his other children and step children from other marriages did]. I think the idea of having this generic before-my-time photo of my dad is one that I’m glad I still have. And with Father’s Day just a few days away, that’s good enough for this child. Sorry you had that sort of relationship — or lack thereof — with your dad. Maybe I shouldn’t say how much you two look alike. Thanks. I always thought we didn’t look that much alike, but the older I get, the more it shows. Yep you really do look alike. Sorry to hear about the relationship you had with him. Hey, it’s all good. Nothing really bad cause there was no relationship there to go bad.